When I first tried Nana Joes granola, I was working at Bi-Rite Market in San Francisco. When Bi-Rite started to carry the granola from this women-owned company, my curiosity piqued and I bought a taste of the Cluster Blend with cashew and white peach granola from the bulk bin. To put it simply, I was blown away. This blend had the perfect texture with the organic oats clumped together with cashew butter, nutty olive oil, and chewy peaches. Most granolas are way to sweet for me, but Nana Joes gets it just right. They only sweeten their granola with a touch of maple syrup. This makes it a great granola for people that are trying to move away from cane sugar and/or other artificial sweeteners, which are all too pervasive in breakfast cereals. Every batch is made with delicious and simple ingredients that are vegan, organic, non-GMO, and gluten-free. The produce is largely farm-direct (i.e. buying almonds from local farms) and fair-trade. This makes the price tag higher than machine-produced granolas, but it's important to note that a lot of conventional granolas also used refined sugar and other processed ingredients. It's safe to say that Nana Joes is still my favorite brand of store-bought granola, which is probably because it doesn't taste store-bought. All of the granola is handmade in small batches just a few miles from my house in the Dogpatch neighborhood of San Francisco. This granola uses real ingredients made my real people. 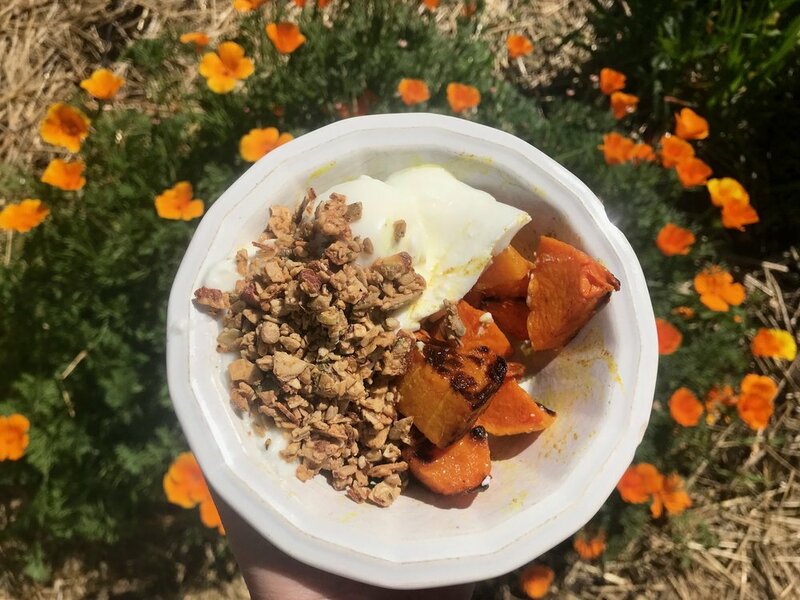 The most recent addition to the Nana Joes granola line is their Paleo Sunrise Series, and I'm here to share a few of my favorite ways to eat it. Morning vibes started off on a high note with this delicious smoothie. Packed with vegetables, fruits, healthy fats, and protein, a sprinkling of Nana Joes' Paleo Sunrise granola is the perfect way to top off this healthy smoothie. Nana Joes' Paleo Sunrise granola. The orange and maple bits of flavor in the granola add some brightness and sweetness to the tart yogurt and hearty squash. This is a great way to start your day off with some veggies and a whole lot of beta-carotene. This is perhaps my favorite breakfast bowl combinations of all time. The Nana Joes paleonola adds that extra crunch that really puts this dish into the breakfast-will-never-be-the-same zone. The turmeric blueberry muffins are from Green Kitchen Story's cookbook, Green Kitchen at Home. This is my all-time favorite cookbook. Every recipe in the book is plant-based, easy to follow, and ridiculously tasty. Nana Joes Paleo Sunrise Series granola with cranberry, almond butter, and pecans. This posting was made in partnership with Nana Joes. Delicious granola was provided but all of the content is my own.